The Wet-n-Wild party is one of the coolest (and wettest) child birthday parties there is! You can have this party at a pool, lake, at the beach, or even in your back yard (make sure you’ve got a hose…). First, you’ll need some cool partyware. Choose from this large selection of inexpensive themed partyware for child birthday parties. Getting fun and creative with invitations for your child birthday parties is an excellent way to generate excitement for the big day. 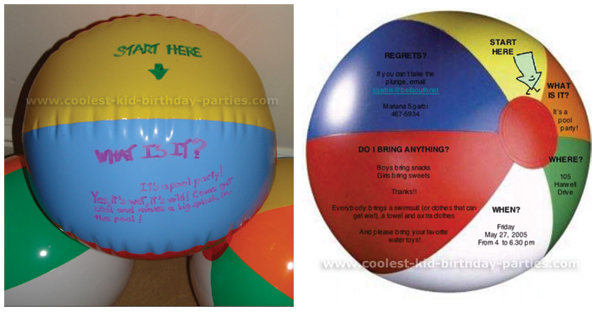 Get a hold of small beach balls and write the invitation on them when they are inflated. Then, take the air out and send them in 8X11 envelopes. Tip: if the kids don’t know how to swim yet, you can write the invitations on orange swim floaties. You can write something like: “It’s wet, it’s wild….. Yup! You guessed it you’re invited to catch a wave and hang loose with kid name in his/her Splish-Splash Wet N’ Wild Party! !” Add the ‘wet down’ day and time, the soaking area (address), RSVP, etc. Let them know that it’s going to be one of the wettest child birthday parties they’ve ever been to, so they should bring a swimsuit (or clothes that can get wet), a towel and extra clothes. Remember to write on the invitations “don’t forget to bring your bathing suits and a towel!” (you might consider arranging extra towels at the party just in case). Another cool idea is to make flip-flop invitations. First print out all the information so that it forms a 2″ wide column down the center of a light blue paper (card stock is needed for this). Then take a kids’ flip-flop sandal and trace around the writing (make sure it’s a small size that’ll later fit into an envelope). Cut out the shape of the flip flop, and add 3 holes with a paper punch (one between the big toe and second toe, and two on the sides just like the flip-flop). Next, pound eyelets in the holes to keep them from tearing (eyelets are available at craft stores in the card making section). Then thread ribbon or felt sticks into the holes to form the straps of the sandals. You can make the straps long, so that it looks like you can put the sandal on and just walk on over to one of the most enjoyable child birthday parties there is. Decorate with blue and green balloons and streamers and get the party area looking as much like a beach or poolside as possible (or just have your Wet-n-Wild child birthday parties at the beach, pool or nearby lake ;-). 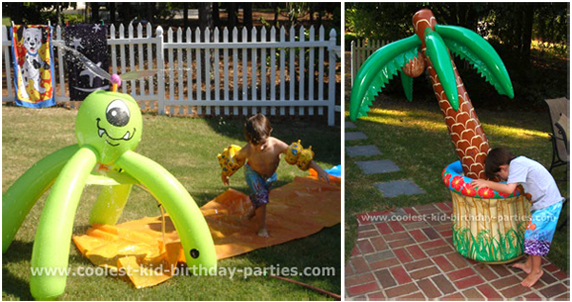 Use all kinds of water-related inflatables all around the party area. Put up signs saying “NO LIFE GUARD ON DUTY”, “WATCH OUT FOR SHARKS”, “HANG LOOSE”, “LIFE’S A BEACH”, etc. Use a blue or greenish tablecloth and scatter sea shells, starfish, etc. You can also put fish netting over the tablecloths. You can have a centerpiece of tropical fruits such as pineapple or coconut (which you can tie balloons to). Cut out blue waves from construction paper, and tack them to the top of fences, doors, chairs, practically anything! Bubbles work at many different child birthday parties – especially this one! Get lots of bubble bottles and bubble guns (or if you really want to go wild – this awesome and inexpensive bubble-blowing machine) and blow bubbles across the room while you watch the kids race around trying to pop them. (Check out some of these awesome bubble games, tools and recipes…). Get out the sprinklers with a variety of heads and hoses, the kiddy pool, and any other fun water toys you have around the house. Don’t forget the squirt guns, water pails, and sponges! (You can also put beach-related items such as seashells, starfish, plastic crabs, beach balls, shovels and pails etc.). Make a slippery slide on the lawn by spreading large plastic garbage bags over the grass, and attach a hose at one end. You can also slip and slide using a tarp with soap and water on it (laying the tarp on a hill with the hose staked to the tarp). Here’s a cool recipe for sand dough so that the kids can make their own sand castles: Mix 4 cups of sand, 2 cups of cornstarch, and 4 teaspoons of cream of tarter into a large saucepan, stir in 3 cups of hot water and cook over medium heat until stiff and until water is absorbed. Then let the concoction cool. Kids can form castles with their hands or use small sand molds (it may be best to coat molds with a vegetable spray beforehand for easy removal). The kids can make LifeSaver gummies or hard candy necklaces. Just give each one a fairly long string and let them put on all kinds of different colored lifesaver gummies to form necklaces they can eat later on. Check out the cool Pool theme party cake ideas on coolest-birthday-cakes.com, the Web’s largest gallery of homemade birthday cakes. You’ll find thousands of cakes submitted by visitors like yourself with photos and how-to tips. Make blue Jell-O as directed in instructions (but only use ¾ cup of cold water) and pour into prepared pan. Then, refrigerate (uncovered) for an hour or until it completely sets. After this, make a 13″ X 9″ white cake (from scratch or from a package). After the cake cools, cut it into a kidney shape and place it on a cake board. Then hollow out about ½ an inch from the top of the cake (make sure to leave about ¾ inch for thick walls as a border) and then freeze the cake. Once cold, spread white icing over the sides and border of the cake with a palette knife. Then, press colored wafers (strawberry, vanilla, chocolate, lemon etc.) onto the side of the cake for a fence. Take the blue Jell-O with a spatula and pick up long slabs to arrange in the hollowed-out center of the cake (ripple a bit to resemble waves). Press in a wafer for a diving board and arrange chocolate finger cookies for wooden planking (or decorate border with sprinkles for a festive look). Just before serving, you can place gummy bears or little Lego people in life-saver candy and life-saver gummies for swimmers in inner-tube floats. You can also add gum balls for beach balls and thin chocolates for rafts. A key element to the gastronomic success of child birthday parties is coming up with cool, original, creative (and tasty) food, drink and treat ideas. Below are some suggestions that’ll get you going. Here are some ideas for your Wet N’ Wild party cuisine. A Barbeque (hotdogs, hamburgers, etc.) is always a great idea for outside child birthday parties such as this one. You can also have a buffet where everyone gets to build their own sandwich or sub. Tip: Each paper plate can be placed inside a Frisbee. The kids love this. A cool idea for drinks is to blow up a floating boat and fill it with ice, put all of your drinks in there and then let the boat float on the water :-). That way you have a floating bar (all the drinks are in the boat). COOL Fruit Smoothies: Blend all kinds of fruit in the blender (with water, ice, milk or yogurt), and top with whip cream, wedges of fruit, blue or green straws and umbrellas. Ocean Water: Put gummy fishes or gummy sharks inside. You can also freeze the gummy fish and sharks in cubes of ice. Pop Rock Punch: After you’ve placed a filled glass in front of each guest, add some seaweed dust (a few Pop Rocks candies) to each cup. It will then crackle, pop, and split when it comes into contact with the liquid. Important: When you’re throwing outside child birthday parties on a hot day, make sure the kids drink like camels! LifeSavers (gummie or hard candy). You can write something like “For your safety, LifeSavers are provided!!”. Frozen Fruit Pops: You make them by mixing with a wire whisk 3 cups of juice, one 14 oz. can of sweetened condensed milk, and ¼ cup of lemon juice. Then transfer the mixture to a container with a pouring spout and put the mixture into paper cups (fill almost to the top) and put them in the freezer for an hour. After an hour, take the cups out of the freezer and place a wooden stick in the middle of each fruit pop. Then, return them to the freezer for five hours. When you want to serve, peel off the paper cup. A cut out Watermelon shell with watermelon, melon, pineapple, and more tropical fruit pieces inside. Another idea is to chop the top off of a pineapple (just underneath the green), take a big spoon and scoop all the pineapple out (leaving just the shell). Then put all the fruit pieces (such as strawberries, kiwi, orange etc.) in the pineapple shell. Lastly put the lid of the pineapple back on the pineapple so that it will be a surprise for everyone who will think it was just a plain pineapple. Frozen Chocolate Bananas: You’ll need 3 bananas, 6 ice-cream sticks, two 1-1/2 oz. chocolate bars and one tbsp. of chopped nuts, granola, shredded coconut, or crispy rice cereal (this is optional). First off, peel the bananas and remove all the stringy fibers. Then, cut the bananas in half (widthwise) and push an ice-cream stick through the cut end of each half. After this, cover them in plastic wrap and freeze them for about 3 hours. In the meantime, put the chocolate bars in a microwave-proof bowl and cook for about 2 min. on high (or until the chocolate is melted). Then stir in the nuts, cereal, granola or crispy rice. With a butter knife, spread the chocolate mixture, just made, over the frozen bananas and coat them entirely. Rest them on a plate covered with waxed paper and freeze until you’re ready to serve them. Ocean Jell-O: Make blue Jell-O, refrigerate and let it partially set. Then put gummy fish and gummy sharks inside. When the Jell-O is ready, top each cup with a thin layer of ‘sea foam’ (cool whip) and some more gummy life preservers. Here’s a great selection of cool wet-n-wild favors and trinkets, an important part of the success of your child birthday parties. For the Wet-n-Wild party, you can create your own favor packs using sand pails. Stuff them with sunglasses, sun block, water squirts, little towels, little watercolor sets, bubble bottle necklaces, little beach balls, sunglasses, water balloons / bombs, swimming goggles, little floaties, etc. Another great idea is to give each kid a frozen water balloon with a prize inside. After tearing off the balloon, the kids can race to see who can melt their ice ball first in the pool to get their prize. For the thank you notes, have everyone’s photo taken while they strike a dramatic surfing pose! To set the stage, put on some inspiring music (like the Beach Boys), then spread a blue tarp or blanket on the ground, and then a surfboard (or a folded-up ironing board) on top of it. Guests can then take turns “riding” the board while you snap photos of them to add to their favor packs, or send with thank-you notes. To make it a wet scene, have someone splash a hose on the person while posing for the picture.